I want to pay my electricity bill. I need to communicate with my manager and submit my reports urgently. I want to buy new clothes for my kid, but I don't have the time to go to a store. Oh...it's 10 PM; I am running late for my flight. Where is my cab? I have been in this city for the first time; which hotel should I book? A mobile app to do the job. –Web apps are not real applications; they are actually websites that open in your smartphone with the help of a web browser. Mobile websites have the broadest audience of all the primary types of applications. –A native app is developed specifically for one platform. It can be installed through an application store (such as Google Play Store or Apple’s App Store). –Hybrid Apps are a way to expose content from existing websites in App format. They can be well described as a mixture of Web App and Native App. Explanation : There are many open source mobile automation testing tools (like Robotium) which needs compilation or modification of the source code before conducting testing and even after testing also we need to remove those changes. It means in these cases we are not going to test the application whatever we are going to submit to the play store. For Android, No Support for Android API level < 17(for android v>4.1) if you mobile having less than 17 then we need to go for selendroid. 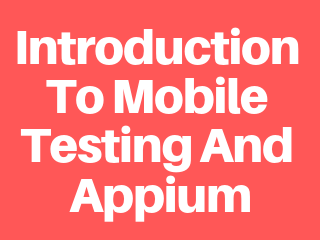 Appium is mobile web, native and hybrid software application test automation tool developed and supported by Sauce Labs . It is open-source software automation tool which is useful to automate android and IOS platform apps. Appium works as a Client/Server architecture. To JSON wire protocol the communication will happen with session ID's only. Q) How come the server will identify which session it needs to create? Desired Capabilities are sent by the Client to Server via JSON Objects by requesting the automation session we need. It’s a nice information being shared. The admin has given a full fledged importance for this blog.